Until my Pert Plus commercial. 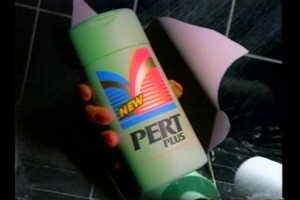 Curt Harnett, the multi-medalled sprint cyclist, had done a Pert Plus commercial that ran during the Olympics. Proctor and Gamble must have liked how it went because I got hired to do a post-Games follow up. It was going to be tough to follow up Curt’s gorgeous blond locks… but I was game! Being behind the scenes was an eye-opening experience. Making the 30 second spot took over 4 days of my time and I’m sure exponentially more of the editor’s & director’s time to create. The way they filmed me so it would look like I was actually rowing was so creative and the attention they paid to the “glamour shots” was incredible. When the commercial started to run I was super proud. 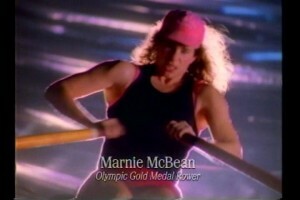 “Marnie McBean; Olympic Gold Medal rower…” the deep voice began…. Suddenly almost a year after the Olympics, when I walked down the street people would wave at me, or even stop me; “Hey!! Are you Marnie McBean? I saw you on TV!” they’d say. I thought it was awesome. Had I become a recognizable athlete? I’m not going to lie…my ego kind of liked it. One night, at the Ceeps someone gave me the “Hey! You’re the Pert Girl!” line. I was proud – but also a bit frustrated by the number of times I’d heard that particular shout-out so I responded – “Yes – but I’d prefer for being known for winning two gold medals at the Olympics!” The guy’s response? – “Cool. You did that too?” honestly??? that’s why they knew me???? Oh boy, some things really do keep your feet on the ground (and thankfully – my ego in check!) I got my head out of the clouds and got back to training. Recently, I spoke at an event for Proctor and Gamble and they gave me a copy of that commercial from long ago. Thanks again P&G! For a chuckle – here it is. Pert Plus commercial – McBean from Marnie McBean on Vimeo. Good story. I totally remember that commercial (as well as Harnett’s!) and you were both hero’s in my mind. I can tell you from my perspective as an ordinary joe sports fan that when I see an athlete that I admire in public I always do my best to admire from the shadows. I really think it’s inherently Canadian to try to give that person their space even if you have a great urge to strike up a conversation and give them the attention that they may or may not crave! The liquid courage part of your story then makes sense to me in that regard!